So I realize this is stating the obvious way late in the game, but there are so many beautiful things that can be made simply by tying and knotting string. I've been enjoying learning more about crochet, and I love that it is allowing me to appreciate the way everyday items (clothes, blankets, etc.) are made. 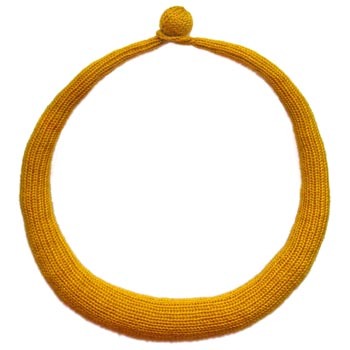 To get more practice after making these necklaces, I decided to purchase this pattern from Etsy shop sewella for a different type of crochet necklace. The pattern is $5, but the vendor gives permission to sell the products you make as long as you credit her for the pattern, so I think it's worth it. I decided to give it a try with multiple colors, partly because I didn't have enough of any single color of embroidery floss to make an entire necklace. Using this method helped the process go by faster, which I like because I can get tired of a project and lose my inspiration if it takes too long. To add a new color I simply tied the new thread to the old one and hid the knot inside the necklace. Since this was my first go at it, it's not the neatest or most consistent in stitches, but I think it improves toward the end. After completing this necklace, I decided to improvise with the pattern to make another necklace I saw online here. For this one, I used the same (1.5 mm) crochet hook, but rather than embroidery floss, I used (1.7 mm) crochet thread, since it's thinner and easier to use (because it has fewer strands to accidentally separate). I began this second necklace according to the pattern, and after every 15-20 rows, I added two or three more stitches to increase the size of the tube. Because this necklace is thicker, I decided to fill it with batting to help keep its shape. As I crocheted more rows, I continued to measure the necklace length around my neck to gauge where I needed to begin decreasing the number of stitches per row. When I was a little over halfway finished, I decreased the stitches by two or three every 15-20 rows (as evenly as I could) until it reached the length I wanted. Then I returned to the original pattern and made a clasp. Like the first necklace, it's a bit rough, and I would change a few things in making it again (add a few more rows for length, add a little more batting throughout, make the size change smoother, etc.). This one took me a lot longer, and I lost inspiration about half way through, which didn't help. Perhaps next time I will change colors or create a pattern (like this one with beads!). Anyhow, I would definitely recommend the pattern I bought, and the seller even threw in a pattern for flowers as well, which I plan to attempt soon. Perhaps it's like the skiing versus snowboarding debate, but for what it's worth, I think I vote for crochet over knitting at this point.